I first met Egeria when I was in seminary. I didn’t meet her face to face, of course, since she lived in the later 4th century. So what I learned of her came via the pages of her diary, and among other things those pages provide the earliest detailed account of the Holy Week liturgy in Jerusalem. I have to give Egeria a lot of credit for her gumption. It wasn’t easy for her to set out from Spain at a time when there wasn’t much in the way of a travel industry to serve tourists. She and her retinue may have been wealthy, but they still had to improvise along the way. So while we modern pilgrims may complain about unfamiliar food, cramped buses and the jammed streets in the old city of Jerusalem, we have it easy compared to her. She and her friends had to deal with life on a more basic level. Still, despite the hazards of the route, Egeria’s narrative inspired droves of people to follow in her steps. I also give her credit for her liturgical stamina. Holy Week liturgies in Jerusalem went on and on and on. But they did so because there was so much to do. They were filled with chants and readings and prayers and processions; and taken together they must have left pilgrims exhausted. But therein lies the attraction. Holy Week in Jerusalem was an awesome experience, and it changed lives. And part of what transformed people was the common experience that welded individual pilgrims into the people of God. I always recall Egeria during Holy Week. It’s not because the abbey church will be jammed tightly with pilgrims, as Jerusalem can be. Nor will our liturgies go on endlessly, though they will be leisurely and lengthy. Rather, the experience of worship together will somehow shape us into the people of God. Many years ago I attended the Easter Vigil at a small Catholic church in Wales. Designed to hold about a hundred, that night nearly 200 of us managed to squeeze ourselves in. In true Welsh tradition the choir of eight voices sounded like fifty, and together we accomplished something we never could have done had we prayed alone. We prayed together, and as we huddled together in that tight space we became the people of God. The important thing about Holy Week is the participation, alongside others. Holy Week is not something people should do all by themselves. And if some parishes or even monasteries fall short when it comes to the music or the size of the crowd, that’s of secondary importance. It’s our praying together that forges us into a community. It’s the readings and hymns and the presence of fellow pilgrims at our elbows that shape us into the people of God. During this one week of the liturgical calendar it’s important that we pray together. Nothing compares, and praying alone just can’t hold a candle to it. So this Holy Week I encourage you to join some local congregation in praying the liturgy of Holy Week. Better still, do what Egeria did: take some friends along for the experience. +This was not a good week for travel, and it all turned out to be a mixed bag for me. My only commitment this week was to deliver a talk sponsored by the Program in Catholic Studies at the College of Saint Scholastica in Duluth, MN. It was to be an overnight trip, but it morphed into three because of a major storm. For starters I went a day early, just to make sure I would get there. On the day of the talk everything in Duluth was closed or cancelled, including my talk. Snow, 55 mile per hour winds and fifteen-foot waves on Lake Superior were good enough reasons to close things, and I couldn’t argue with that. But the snow continued for yet another day. So one day became three days, and rather than a public lecture I delivered the talk to my hosts, the Benedictine sisters of Saint Scholastica Monastery. They also pressed me into saying Mass for them, since their regular chaplain could not make it. So I made good use of the time. However, there was a one sad note. On the drive to Duluth, on a two-lane road, a car about a quarter-mile ahead of me crashed into two oncoming cars. One of them burst into flames and the driver died. For a half an hour there was no place to go other than to sit still and watch the dense black smoke. Finally the highway patrol diverted us onto ten miles of dirt and gravel roads, which finally led back to the Interstate. +On Saturday April 13th a goodly number of oblates and friends of the abbey joined us for evening prayer. That same day seventy Latinos from neighboring parishes came to Saint John’s for a day of retreat, led by Fr. Ephraim and Brother Mariano. Then on Sunday the 14th I presided at vespers in the abbey church. 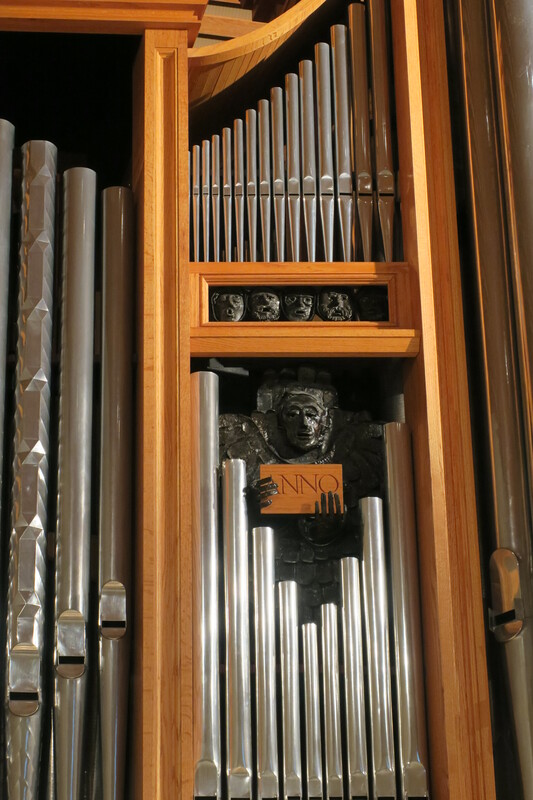 +Work on the expansion of the organ in the abbey church continues, and a recent update hints that installation might begin as early as this summer. 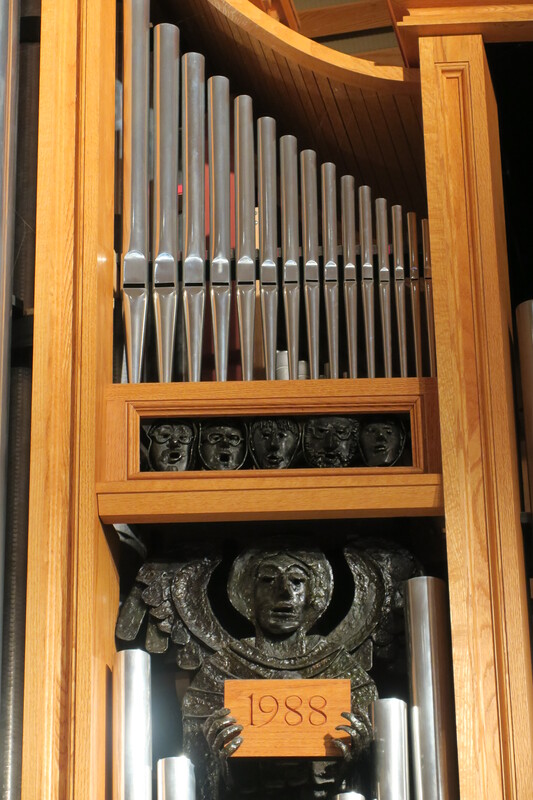 In the meantime last week I had the chance to see the practice organ in the music building on campus. 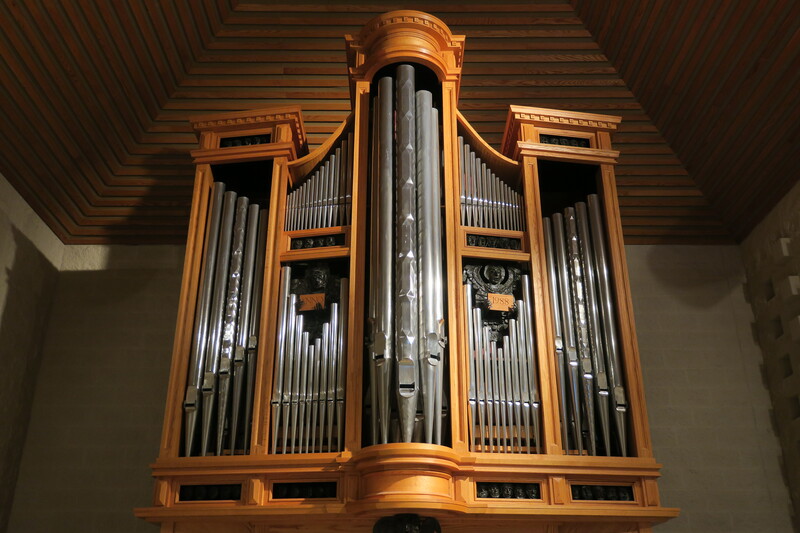 Built in 1988 by Casey Marin, who is involved in the current organ project, that organ serves students and faculty in the University. 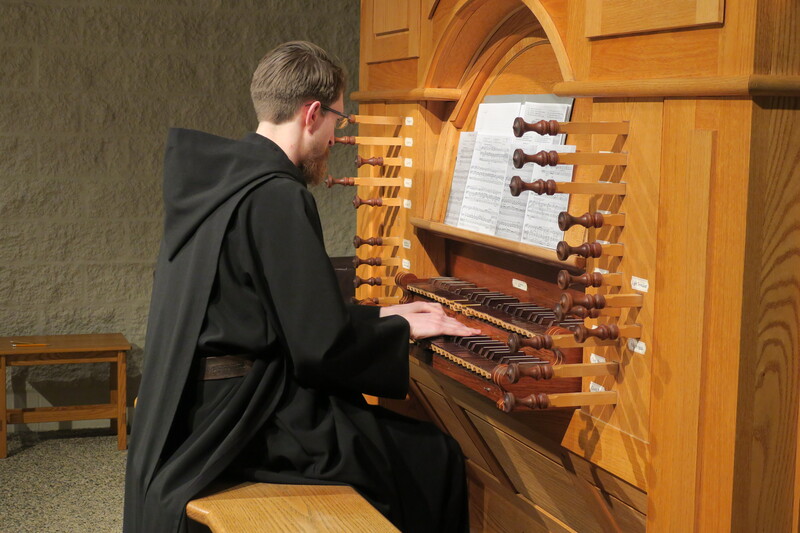 On the occasion of this visit I went with Brother Jacob, who is shown at the keyboard. Music, of course, figures prominently in the Holy Week liturgies. Most notable is its absence following the Holy Thursday liturgy.